Florida, the tournament’s top overall seed, will face the University of Connecticut, coached by former Bulls guard Kevin Ollie, followed by Kentucky taking on the Wisconsin Badgers on Saturday evening. Always happy to talk about his college days, Noah’s face lit up when asked about the Gators this week. 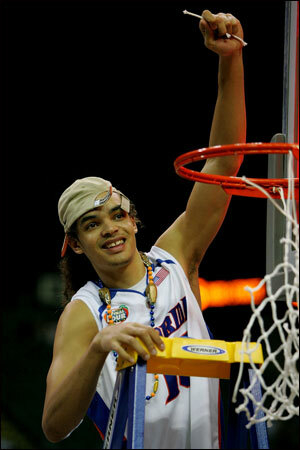 Cutting down the nets following a national championship, which Noah and his teammates did in 2006 and 2007, surely was also a good feeling. And while Noah played a major role in both title runs—he was named Most Outstanding Player of the 2006 NCAA Tournament Final Four—he’s quick to credit Gators coach Billy Donovan for the job he’s done then and now. Noah has kept in touch with Donovan over the years and it’s not unusual for him to visit campus in Gainesville during the offseason. Thus he’s gotten to know several of the Gators who have followed in his footsteps and it’s this year’s upperclassmen in particular who he is happy to see succeed. Erik Murphy, a Bulls draft pick who the team requested waivers on Thursday, was with that group of seniors who came up short in the aforementioned three consecutive Elite Eight appearances. He echoes Noah’s sentiments and hopes that the team’s talent, coupled with its experience, is enough to win the school’s third national title in basketball. Murphy elaborated on what makes Donovan, who now coaches his younger brother Alex, a redshirt sophomore who transferred from Duke in December, so successful. Should the Gators advance, they could be squaring off against Kentucky, who at No. 8 is the lowest remaining seed. And Mohammed knows a thing or two about that, as he was member of the NCAA Championship teams in 1996 and 1998, scoring 10 points as Kentucky outlasted Utah in his final collegiate contest. Though it’s John Calipari who now coaches Kentucky while Mohammed played for Rick Pitino and Tubby Smith during his days as a Wildcat, he likes what he’s seen out of Calipari since his arrival in Lexington five years ago.